Former Speaker of the House Newt Gingrich, also a former college history professor, has written a number of alternate history novels. But the plots of his re-imaginations of World War II and the Civil War would pale in comparison to the potentially very real story of his comeback from Republican afterthought to possible Republican presidential nominee. A Des Moines Register poll released over the weekend shows Gingrich leading the GOP field 1 in Iowa with 25%. His next closest competitors are Rep. Ron Paul at 18% and former Massachusetts Gov. Mitt Romney at 16 percent. This number represents a huge gain for the former speaker, as the last poll, released on Oct. 29, had him in fifth place with 7%. Poll 2 after poll 3 released this week has shown him solidifying his Iowa lead. With less than a month before the Iowa caucus on Jan. 3, the poll seems to send a clear message. A closer look at the data reveals some interesting numbers, though. Despite the highly positive numbers for Gingrich, 60% of those polled stated that they might switch their support to an alternate candidate, while 11% remain undecided. Even more remarkable is that 38% of respondents view Romney as the most electable candidate compared to 22% for Gingrich. Yet Gingrich still leads the poll comfortably. While a lot can change in a month -- especially in this topsy-turvy Republican field -- Gingrich, amazingly given his campaign implosion earlier this year, is in a very good position to win the Hawkeye State. His lead is big enough now that it might be out of the other candidates' power to stop him there now -- but, like Republican front-runners before him, he may very well stub his toe between now and Jan. 3. American presidential elections historically contain many supposed truisms that upon closer review are not completely true. For example, Ohio has long been viewed as the decisive state in the Electoral College; if you win Ohio, you win the election. However, that was not true in 1944 or 1960. Take another example: It is conventional wisdom that an incumbent president's party always loses seats in the House of Representatives during a president's first midterm election. Yet Democratic gains in 1934 under Franklin Roosevelt and Republican gains in 2002 under George W. Bush proved that to not always be the case. 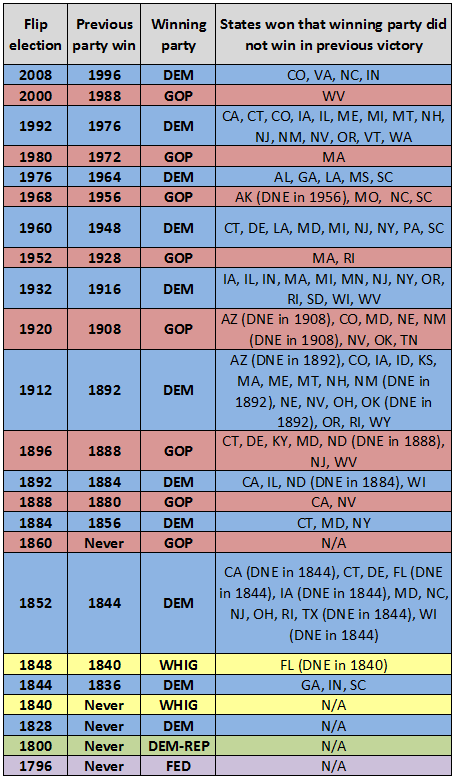 However, there is a pattern in American presidential elections that has always held true: When a political party wins a flip election (that is, when it regains control of the White House), it always wins a state that it did not win the last time it won an election. This truism has been put to the test several times, such as when Ronald Reagan won Massachusetts in 1980 after Richard Nixon won every state save the Bay State and Washington, D.C. in 1972, or in 1848, when the Whigs' Zachary Taylor carried Florida, which was not a state when the Whigs won their first presidential election in 1840. Nevertheless, the pattern has always held. What does this mean in 2012? If the Republicans win the White House, they may very well win a state that they failed to carry in 2004, the last time a Republican won a presidential election. To consider recent polling, there's a decent chance that President Obama will lose New Hampshire this time around, and if the GOP wins the White House while winning New Hampshire, this flip election pattern will continue because George W. Bush did not win the Granite State in 2004. Other states to keep in mind are Wisconsin, which John Kerry only carried by about 11,000 votes in 2004 (0.38% margin), and Pennsylvania, where the President's approval rating has been fairly low considering that the state has leaned Democratic at the presidential level since 1992. The chart below details the gains by a party in a flip election. Thanks to @ConArtCritic on Twitter for alerting the Crystal Ball to this interesting pattern. Here in the Land of Jefferson, the 2012 presidential race is so passé -- we've got plenty of other big races to distract us. Despite still having to conquer (weak) primary competition next year, the top two contenders to replace the retiring Sen. Jim Webb (D) in the Senate, ex-Gov. Tim Kaine (D) and ex-Sen. George Allen (R), squared off in Richmond on Wednesday for an absurdly early head-to-head debate. With nearly a year before the actual election, the debate touched on the topics that undoubtedly will play a role throughout the campaign, namely Kaine's time as DNC chair (Allen wants to tie him to President Obama) and Allen's “macaca” gaffe from his failed reelection bid in 2006 (Kaine wants to make Allen unpalatable to the suburbanites who might decide the election). One thing was clear: neither Allen nor Kaine will be shy about attacking one another. Ultimately, the Senate race -- which we rate as a toss-up -- might have little to do with these candidates' actual campaigns; rather, Kaine and Allen might be stand-ins for Obama and his Republican opponent. In which case, the candidates stands on contraception, uranium drilling and crime (all discussed at the debate) might not mean much. Meanwhile, looking beyond next year's elections, Republican Attorney General Ken Cuccinelli upset Gov. Bob McDonnell's (R) line of succession here last week, when he announced his plans to seek the Republican nomination for governor in 2013. His move sets up what could be a nasty primary with Lt. Gov. Bill Bolling. Bolling cut a deal with then-Attorney General McDonnell in 2009 to run for a second term as LG, clearing the way for McDonnell to run for governor. In return, McDonnell agreed to support Bolling in 2013. But that was before Cuccinelli won the attorney general's race in 2009 and immediately became a darling of conservatives, mostly for picking a legal fight with the federal government over the new health care law's individual mandate to buy health insurance. Cuccinelli, no fan of Barack Obama, nonetheless must agree with the president on at least one point: Fortune favors the bold. Many Democrats resented that Obama challenged Hillary Clinton for the party's presidential nomination in 2008, arguing that Obama should wait his turn, much like Bolling did in 2009. Obama, of course, is in the White House, and Cuccinelli could become governor in 2013 -- if he can get past the man who waited, Bolling, in the primary. Oddly enough, Obama's fate next year could also help determine Cuccinelli's; since 1977, Virginia has always picked a governor from a party opposite the one holding the White House. Thus, the history goes, Obama in the White House might give Cuccinelli (or Bolling) the keys to the governor's mansion in 2013.